Sweetwater Union High School District announced Monday that it will make $19 million worth of cuts and budget transfers this school year to adjust for overspending in last year’s budget and more than $30 million in miscalculations in recent months. Sweetwater Union High School District seems to be pulling back from the brink of fiscal disaster. But the district is not in the clear yet and the cuts it has to make to stay afloat will hurt students and teachers in the current school year. The district announced at a board meeting Monday that it will make $19 million worth of cuts and budget transfers this school year to adjust for overspending in last year’s budget and more than $30 million in miscalculations in recent months. (A budget transfer means pulling money from a separate account that had previously been dedicated to something else – in effect, it is often the same as a cut.) School officials did not give an exact breakdown of the percentage of cuts to transfers, but it appears more than half of the $19 million comes in straight cuts and hiring freezes. Some of the biggest cuts target special education, adult education, textbooks and supplies, current vacancies and professional development. Sweetwater’s adult education program offers basic skills, GED, and language classes to people over 18. Many are parents of Sweetwater’s middle and high school students, according to adult education teachers who attended last night’s meeting to protest the cuts. 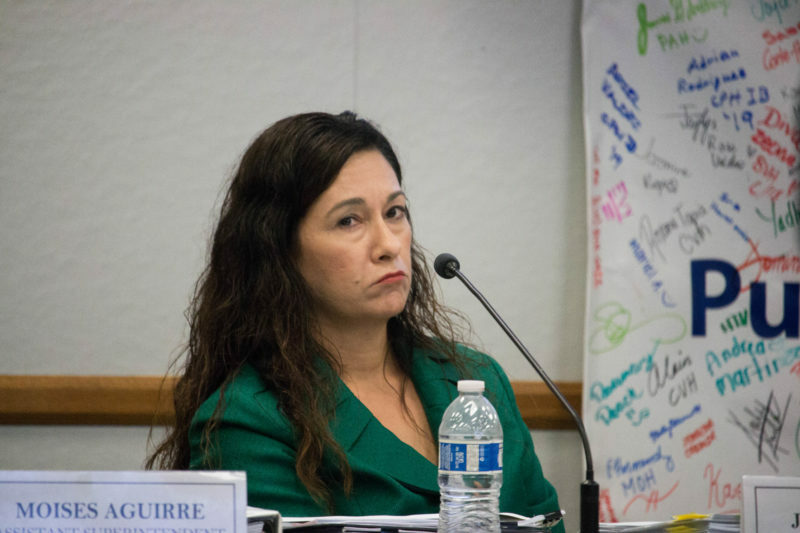 Though school officials tried minimize the problem at hand, it is extremely rare for a district to miscalculate its budget as badly as Sweetwater Union did in recent months. The last time a budget problem of similar magnitude happened in San Diego County, San Ysidro school district partially lost its autonomy to a county-appointed “fiscal adviser.” Districts regularly plan for budget shortfalls in the future, but Sweetwater miscalculated its budget between late June of this year and early September – meaning it had to slash the budget for the school year that is already in progress. “Someone was either very incompetent, wasn’t paying attention or something else was going on,” Bernardo Vasquez, a district parent, told board trustees Monday night. District officials have not given any explanation for the miscalculations, beyond not correctly anticipating the amount of money coming from the state. But a 3.75 percent across-the-board raise that wasn’t fully accounted for appears to also have played a big role in creating the $30 million hole. “As we sit here today, whose being held accountable?” asked Vasquez. The impact of the miscalculations does not stop at this school year. Because the errors badly underestimated ongoing salary costs, the district now predicts it will have a budget shortfall of $10.4 million next year and $5.6 million the following year. The revised budget, which trustees passed Monday night, comes out roughly $360,000 in the positive – a very slim margin. And at this point the budget is just numbers on paper. If officials at the County Office of Education believe the projections that led to those numbers are unrealistic, they still could decide to hand over partial control of the district to a fiscal adviser. A less extreme option would be to appoint a “fiscal expert” who can help guide the district but does not have the power to overturn its decisions. For instance, the district plans to cut its obligation to special education spending by $2.8 million. But many special education costs are unavoidable. If a child is blind and entitled to a visual education specialist, the district must hire one. County officials could see that $2.8 million as wishful thinking – which would lead them to reject Sweetwater’s budget or appoint a fiscal adviser. The County Office of Education must certify all of the school district budgets in the county. It has until Nov. 8 to approve or disapprove Sweetwater’s budget and could decide to appoint a fiscal adviser or a fiscal expert at any point during that time. Recently appointed chief financial officer Jenny Salkeld’s presentation to the board refers to the cuts and transfers as “funding alignments.” Some of the biggest: special education, $2.8 million; adult education, $2 million; professional development, $2 million; vacancies and new positions, $1.7 million; books and supplies, $1.3 million; school staffing ratio changes through attrition, $900,000; athletic transportation, $500,000. Sweetwater is also hoping to squeeze an extra $400,000 by reducing cafeteria costs. But that amount could be especially hard to stomach. At last month’s Sept. 24 board meeting, school board student representative Brenna Pangelinan said students at Mar Vista High School had recently complained to her of being served expired food products – before the budget cuts.